Preliminary discussion toward developing ordinances and regulations for the recently approved sale and cultivation of marijuana was the main activity at the Valentine’s Day meeting of the Board of Trustees. About 50 interested citizens listened intently as trustees talked among themselves regarding different options on subjects such as the number of marijuana-based businesses that will be licensed by the town, hours of operation, acceptable locations within town limits, and distances from schools, daycare facilities and other marijuana-based businesses. The recent survey conducted at Trustee meetings and on the town website served as the basis for the discussion. Town Administrator Rich Sales announced that there would be opportunity at the next step for the public to give more input, but restricted Tuesday evening’s meeting to trustee discussion due to the need to get a basic framework set up for the creation of the ordinances. Sample wording will then be formulated with the assistance of the Town Attorney, then brought back to the trustees at an upcoming regularly scheduled meeting of the Board of Trustees for further discussion, public hearing and input. Watch the town website at www.townofpalisade.org for upcoming agendas to be posted at least 24 hours before meetings, scheduled for the second and fourth Tuesday of each month. There was an agreement to create a ‘marijuana-free zone’ to include the Town Plaza area of downtown as well as sections of Main, Third and First Streets. Residential-zoned areas are off-limits as well, and any kind of marijuana-based business must be at least 1000 feet from a school. The number of marijuana-based businesses to be licensed was the most debated topic, with suggestions ranging from one to an unlimited number. No limit was placed on the number of manufacturing, testing and indoor-grow operations, with other factors such as demand and available locations within town boundaries actually serving to limit their number. Parking regulations remain as for other town businesses, and all types of marijuana-based businesses will require the ‘best available technology’ for ventilation and odor suppression. More concern was voiced on the number of retail sales operations licensed. While most of the trustees were in favor of two or three licensed storefronts, Trustee Bennett Price also argued that the number should not be limited by the town, just as the number of wineries and tasting rooms or liquor stores is not limited. It was generally agreed that the hours of operation for sales or deliveries would be within the hours of 8:00 a.m. to 10:00 p.m. although growing, testing and manufacturing could actually occur at any time of day. 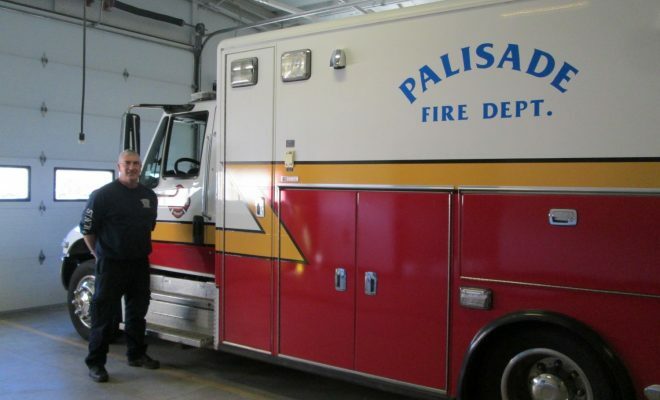 Palisade Fire Chief Richard Rupp invited town board trustees to take a look at the town’s latest ambulance. It was purchased in January and replaces an ambulance that suffered an undercarriage fire on a call to Grand Mesa. 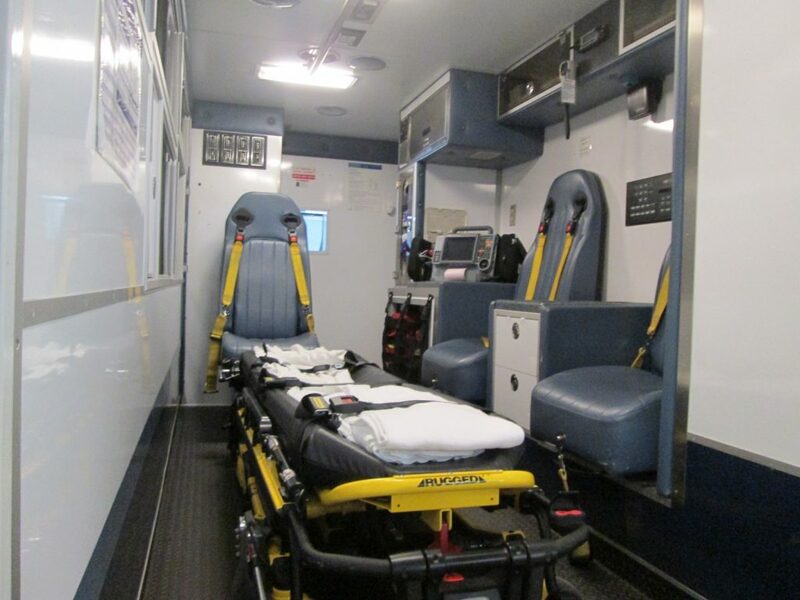 The recently purchased 2010 Horton medium duty ambulance is one of two owned by Palisade. The Horton is large when seen parked in the fire station bay. Joe White, EMS Chief, agreed, saying “It’s big.” It is 24 feet, 6 inches long, 9 feet and 6 inches high, and 8 feet, 6 inches wide. The ambulance features storage of foam containers that can be used to suppress fires, such as a car fire. White said it is known as a Compressed Air Foam System. White said the crew usually consists of the driver, a crew member in the passenger seat, and one crew member in the back. The town received an emergency grant for the ambulance through the Colorado Department of Health and Environment. White said the state paid $32,400. The town was required to pay 10 percent of the purchase cost of $36,000. Therefore the town paid $3,600. White said the public is welcome to come to see the ambulance at the fire station. “We are proud of it and we will walk them through it.” The ambulance will likely first be seen in a parade for the Palisade High School homecoming parade. Trustees approved the hiring of a collection agency from Edgewater, CO, with experience in municipal and other non-profit type accounts to help improve the collection percentage from Palisade’s Municipal Court. The collection agency will add a 25% fee to the fine or fee collected as a service charge, so there will be no real cost to the Town. John Sabal and Maria Montoya, owners of the Palisade Café 11.0, applied and were approved for a Hotel and Restaurant Liquor License at the café. Currently, they are holders of a Beer and Wine License. The Hotel and Restaurant classification will enable the Café to sell liquor and mixed drinks in addition to their selection of local beers and wines. There was also a non-agenda item of interest at Tuesday’s meeting. 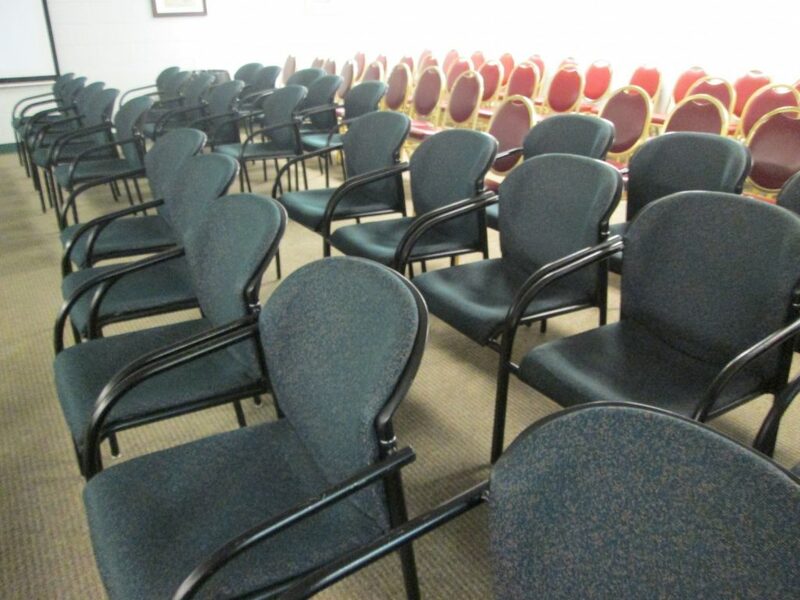 ‘New’ (gently used) chairs for attendees of meetings in the public meeting room have been donated to the Town by the Colorado Municipal League, of which Palisade is a member. About two dozen were placed in the meeting room prior to Tuesday’s meeting, and about 40 more are expected in the next week or so. The chairs are covered in blue fabric and provide arm rests. Some of the 45 or 50 people arriving for the meeting noticed and said, “New chairs. Are they comfortable?” Apparently they were comfortable enough. When Mayor Roger Granat thanked Trustee Dave Edwards for arranging delivery of the chairs, there was some applause from the audience. The next meeting of the Board of Trustees is scheduled for Tuesday, February 28, 2017 at 6:00 p.m. in the public meeting room of the Civic Center at 341 W. 7th St. in Palisade. Agendas are posted on the town website at www.townofpalisade.org at least 24 hours before each meeting or can be picked up at Town Hall. All meetings are open to the public. Next Story → PRAB asks ‘Y’ Not?